Jim Fryer (Trombone, Manhattan) – Jim began his professional career at the age of 16 in the Boston area. He later joined the Paradise City Jazz Band in Northampton, Massachusetts, and played many festivals with them. Since that time, Jim has toured internationally every year, played on dozens of recordings, made TV appearances, and played a variety of theaters and concert halls throughout New England. 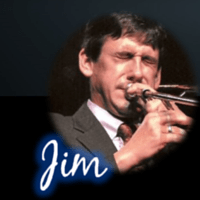 Jim first visited England n 1988 and has returned every year since then with Classic Jazz Epochs and Jeff Barnhart, Paradise City JB, the Hot Cats, and as a solo performer with the UK’s best musicians, including Humphrey Littleton, Kenny Baker and Digby Fairweather. Now living in New York, Jim is one of the busiest brass men in the city. He performs and teaches Jazz seven days a week. Jim is now a featured performer with the Titan Hot Seven Jazz Band and Vince Giordano’s Nighthawks. In his travels he has shared the stage with Doc Cheatham, Kenny Davern, Butch Thompson, Dave Brubeck, Slide Hampton, Milt Jackson, and Rosemary Clooney.